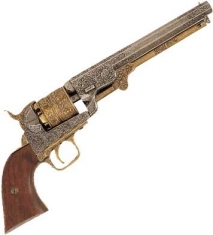 We have a complete Collection of Single action Western Revolvers, the most popular guns of the old west including; replica single action revolver pistols, peacemaker pistols, western fast draw pistols, 1873 commemorative collector pistol, cavalry pistol, the gun that won the west pistol, battle of little bighorn pistol, M1873 single action revolver, gold finish peacemaker, pepperbox pistol, blank firing 22 caliber single action peacemaker, M1860 civil war revolver, ball and cap revolver, civil war confederate revolver, circa 1860 revolver, M1849 dragoon ball and cap revolver, Model 1869 45 caliber Schofield single action pistol, 1849 pocket revolver, model 1873 western army model pistol, 1851 civil war navy revolver, Le mat civil war pistol, black finish western peacemaker pistol. 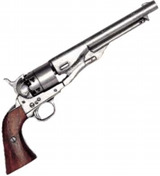 See details Civil War Model 1860 Army Revolver. See details Model 1849 Dragoon Cap and Ball Pistol. 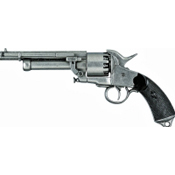 See details 1851 Civil War Navy Revolver. 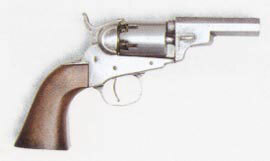 Model 1849 Pocket Revolver. Used by Wells Fargo in the Old West, this replica sheriff's model features wood grips, 5-shot 3 octagonal barrel, .31 caliber. Length: 7.75 Weight: 1.2 lbs. 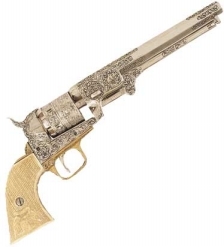 See details Le Mat Civil War Pistol.